Eivy Arroy Diaz, the son of Mexican immigrants emerges as the recipient of the President’s Award for Excellence in engineering. Ken Harrelson, the mathematics professor who nominated Diaz for the prestigious award, said he truly deserves it. “He’s a wonderful guy and he’s going to be very successful not only in the classroom but in the community,” Harrelson said. Diaz, the 25-year-old pre-engineering major said he was surprised to win. Diaz, the eldest of four siblings, said he was raised in south Oklahoma City and graduated from U.S. Grant High School. He said his childhood wasn’t the best. He had to cope with domestic violence and an on-going divorce between his parents growing up. He said, for a long time, he’d never considered college. “I thought I was only going to get through 9th grade year in high school because I got kicked out for wearing the wrong colors, on purpose,” he said. “I was the least expected to go to college,” Diaz said. After attempting a year of college after high school, Diaz took a four year break when he came across a great paying job that allowed him to travel out of town. Diaz said he has a one-track mind when he thinks about achieving success. Diaz said that there’s another option: working hard using your brain. The decision to return to college and continue an education came when his wife, Blandy Arroyo, found out they were having a baby boy. “I would still have that mentality if it wasn’t for my son Ethan,” he said. OCCC has been an educational building block to prepare him to continue higher education, he said. Diaz said he started out in the remedial college math class but he was determined to study that much more to get to where he needed to be. “He was in the Calc. one class and he was a little nervous. But by the time it was all said and done, he was one of the best students,” said Paul Buckelew, a mathematics professor. “I always put emphasis on studying math,” Diaz said. The fear of failure fueled him to keep going and to take in the material his professors presented. “I have met some of the most passionate professors ever at OCCC,” he said. Among those are Harrelson, Buckelew, and Tad Thurston, a physics professor. 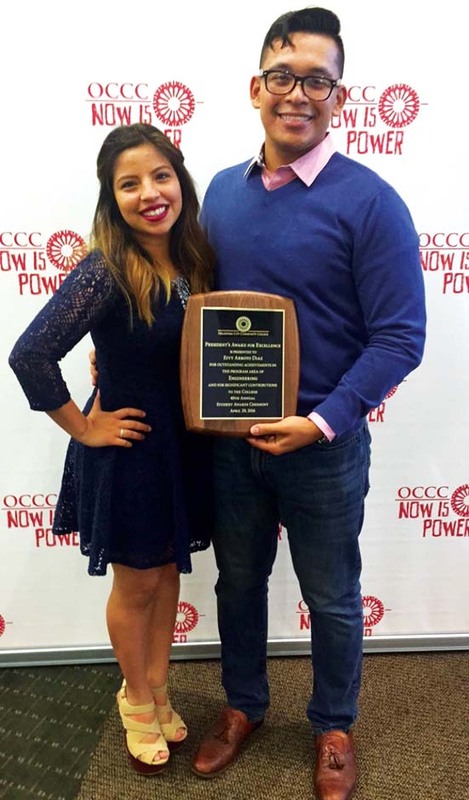 Diaz is currently attending his last class as an OCCC student while also taking 12 credit hours at the University of Oklahoma, as an electrical engineering student. He will graduate OCCC in May as a double major in math and science with an engineering associate in science degree and associate in science in mathematics degree. His success thus far couldn’t have been possible without the support of his wife, close friends and family. Diaz said he would spend 12 hours a day at the OCCC campus as a full-time student between classes and studying. “Sometimes during the evenings my wife would come to campus and bring our son to see me while I took a study break,” Diaz said. Baby Diaz is now two years old. There were many times that he thought of quitting, he said. “People where I come from don’t make it this far, they’re content with blue collar jobs.” Diaz said. “You better not,” Diaz said his wife would tell him every time he contemplated quitting school. “Ethan and I are proud and lucky to have him and thankful he’s working on providing a better life for our family and our future,” she said. Former youth leaders and now great friends, Eli and Rachel Velazquez have also been supportive role models for Diaz. Before returning to college, Diaz said he contemplated attending a technical school and shared his thoughts with the Velazquezs during dinner one night. Their advice for him was to go to college because they knew he was not going to be challenged enough to stay interested in technical school, Diaz recalled. Diaz said he’s setting a new standard for his siblings, cousins and his son by being the first in his family to go to college. “I’ve always wanted to be my son’s t-ball coach, I imagine spending entire weekends at baseball tournaments, living in a nice home and comfortably,” Diaz said. Focusing on providing a quality lifestyle for his wife and son keeps him motivated, he said.